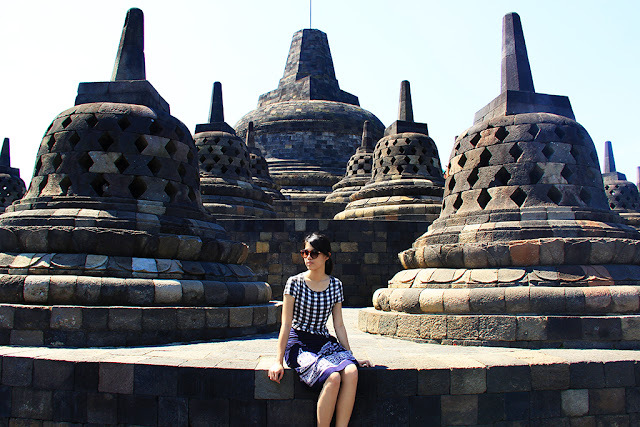 First of all, I just want to tell you that, I was having a hard time deciding which photos that would be live on my blog #firstworldproblem ;) Borobudur is beautiful in its own, so, it's basically photography friendly. 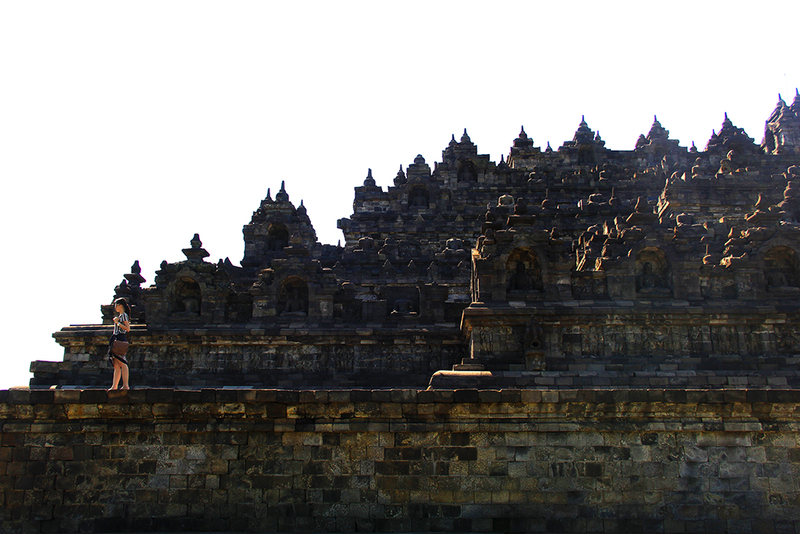 Because of that, I want to make two different blog posts about day 4, and this post is all about Borobudur. And yes yes yes, my favorite photos through out the entire trip are here. We stayed at Cempaka Villa. 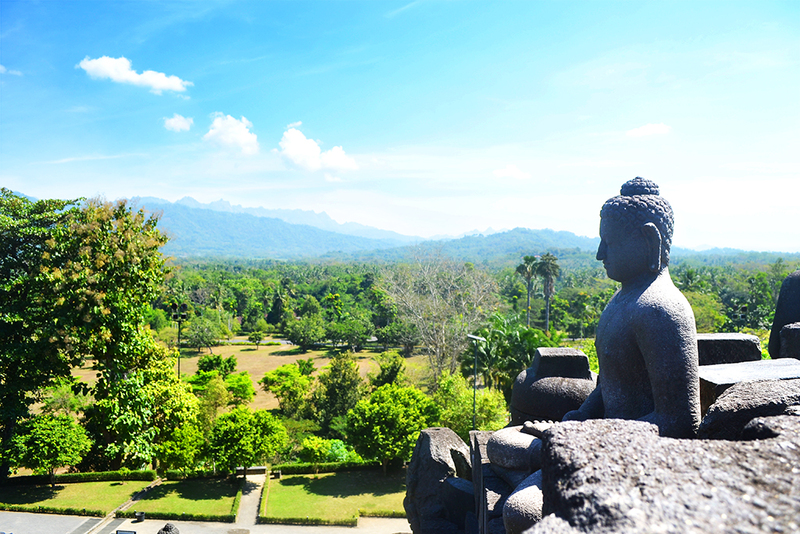 Very close to Borobudur, so you don't need taxi, just walk for 5 to 7 minutes. 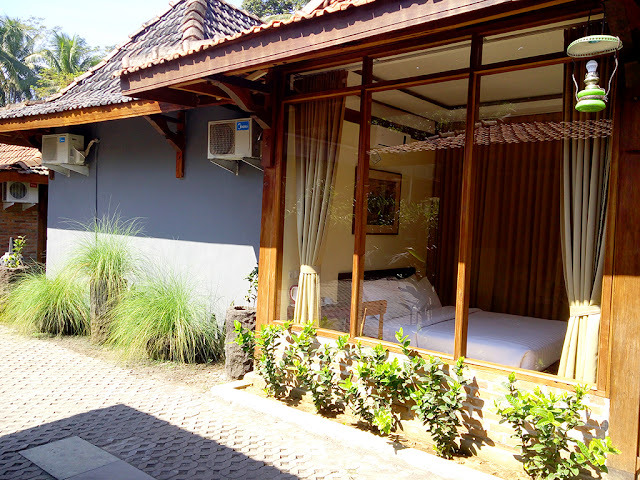 Room rate for triple room was around IDR 600.000,- and IDR 420.000,- for double room. The downsides about this hotel are no soundproof wall (I can hear my friend talking from the other room hahah) and there is only a curtain between bathroom and the room itself which I personally don't like, but overall the ambiance was pretty good. 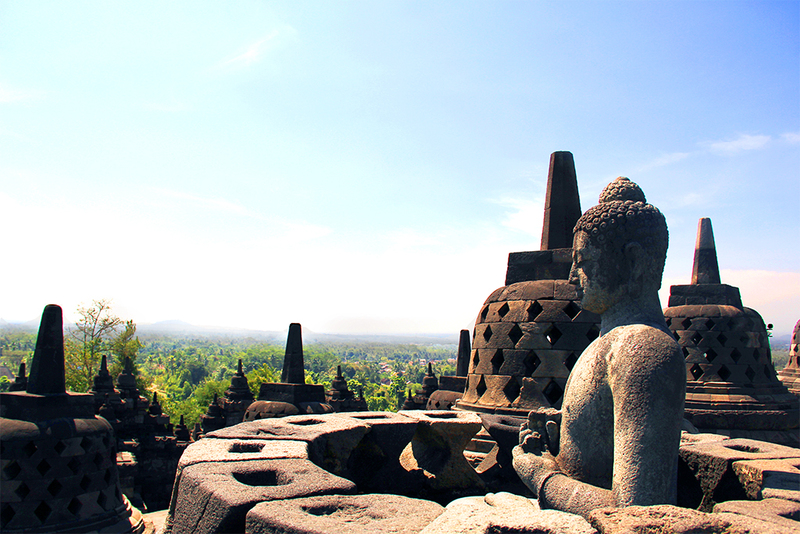 Moving on to the main star of this post...As one of UNESCO world heritage, Borobudur is undoubtedly beautiful. Borobudur is the largest Buddhist temple in the world located in Magelang, Central Java. 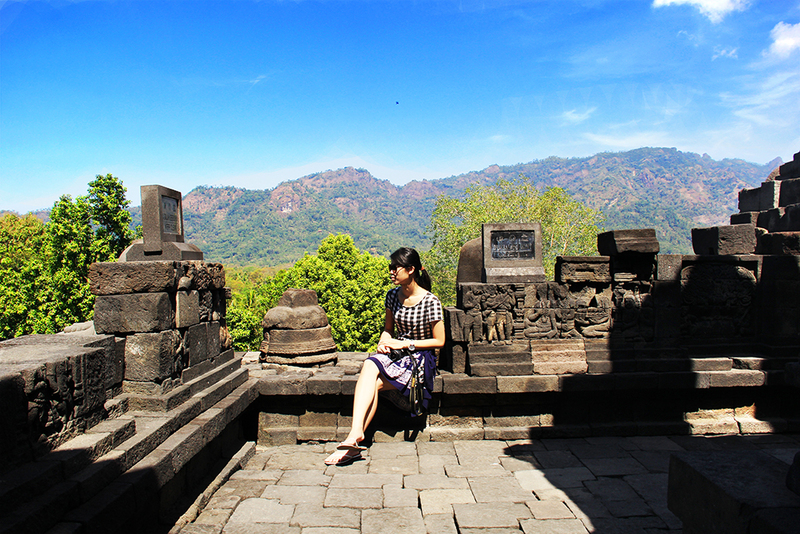 About 2 hours away from Yogyakarta. 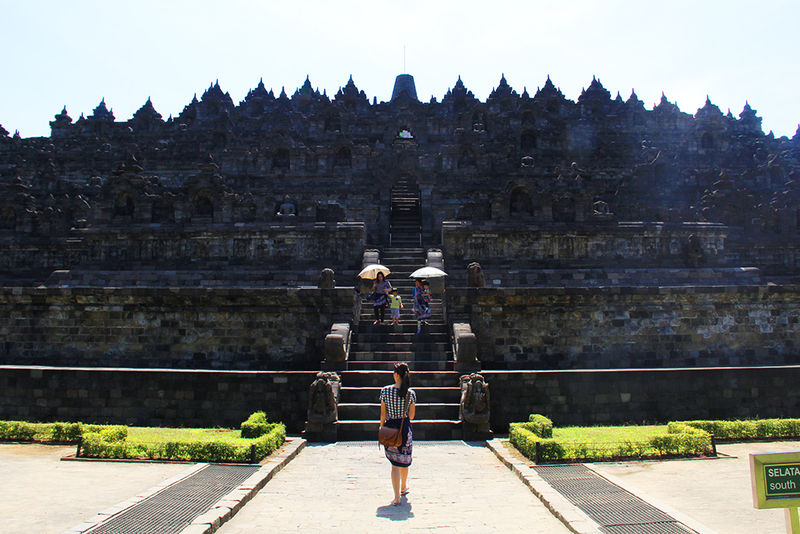 I've been here before, but still amaze by how massive this temple is. 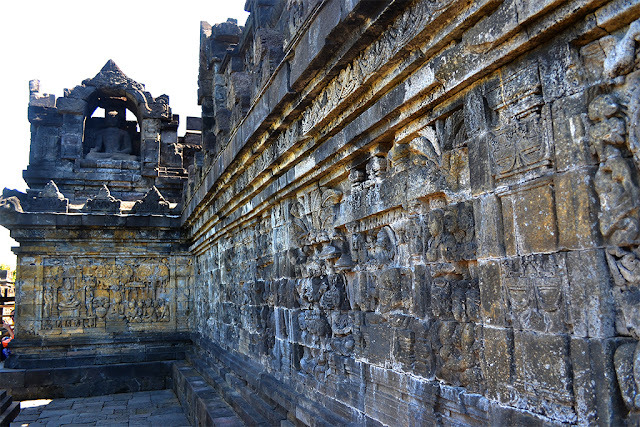 This monument is decorated with thousands of relief panels and Buddha statues. More story of Borobudur here or simply hire a guide. It was very hot that day when I came here, so I rent an umbrella. For your info, there will be so many hat seller and ladies with umbrellas for rent. I initially wanted to buy a hat, BUT, they all look the same, I mean almost every seller, selling same models + it looks like aunty style's hat hahah, and the chance to meet tourist with the same hat as mine is HIGH, so I prefer to just rent an umbrella. If you also prefer to rent an umbrella, DON'T rent it before you pass the ticket area, because you will get cheaper when you get in. 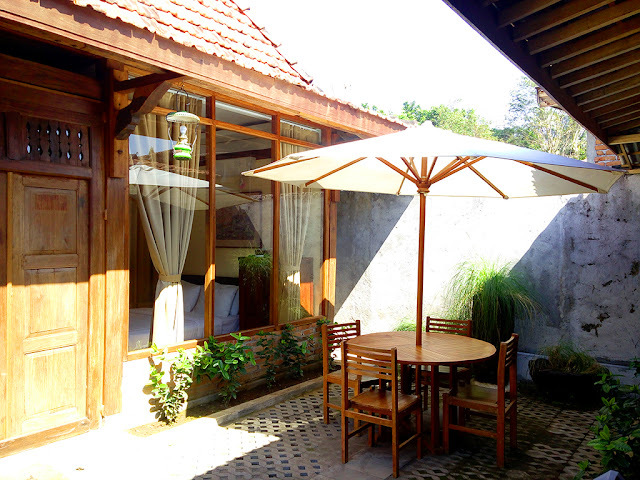 It cost IDR 10.000,- outside, and IDR 3.000,- when you get in. I discovered it because at first I thought that hmm...the sun is okay, get tan a bit is all right, and IDR 10.000,- is too expensive to rent an umbrella, but when one of them offer the umbrella for IDR 3.000,- whoops OKAY, I TAKE IT! so finally I got the umbrella. The prices stated might be different for foreigner. Don't forget to wear a Sarong, you can find it at the entrance, not to far from the temple for free and return it when you've done exploring the monument. 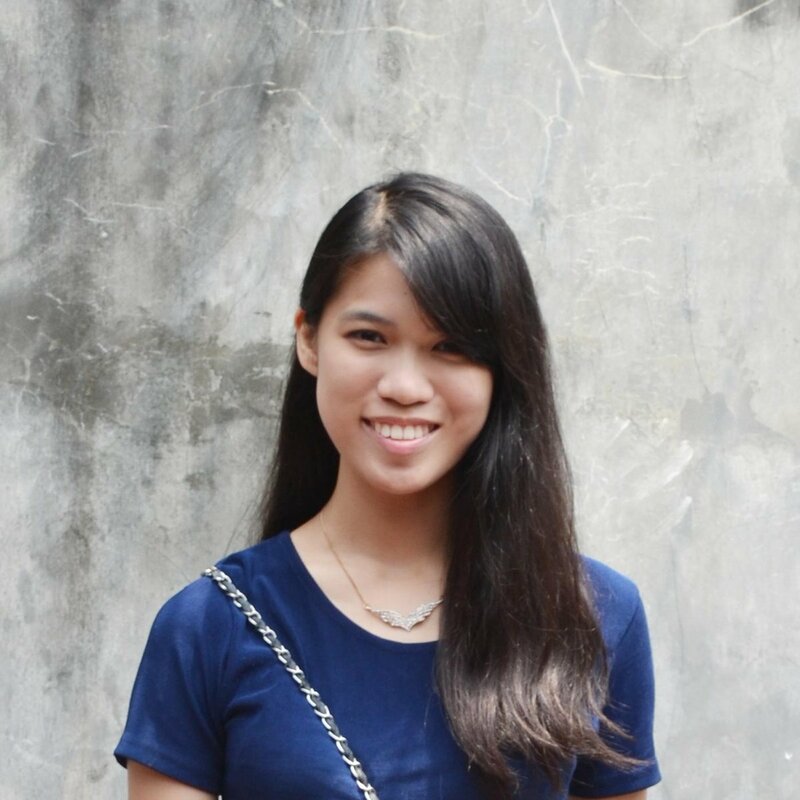 As you can see the blue sarong on me. Hands down to my favorite photo (above). Thanks to the man behind the lens, Timothy. On the way out of Borobudur you will see that there are so many various gift shops that sell tshirt with Borobudur print, bags, and others. As always, don't forget to haggle the price. 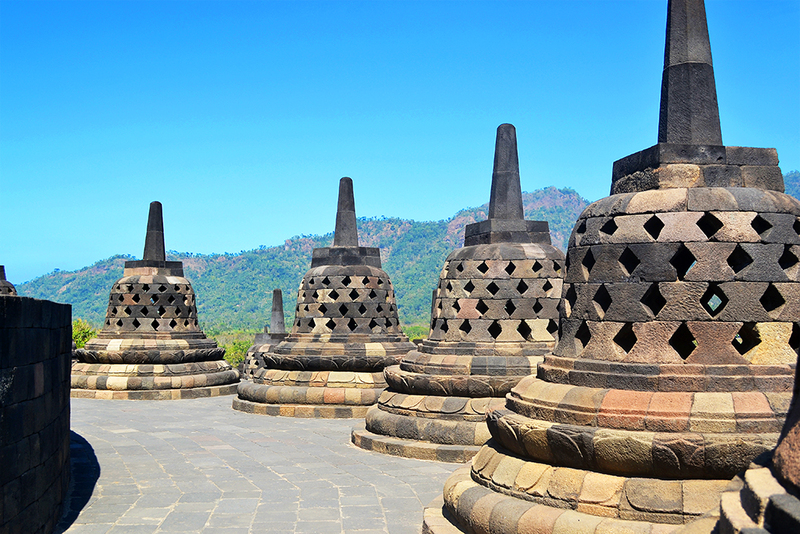 Have you been to Borobudur before? 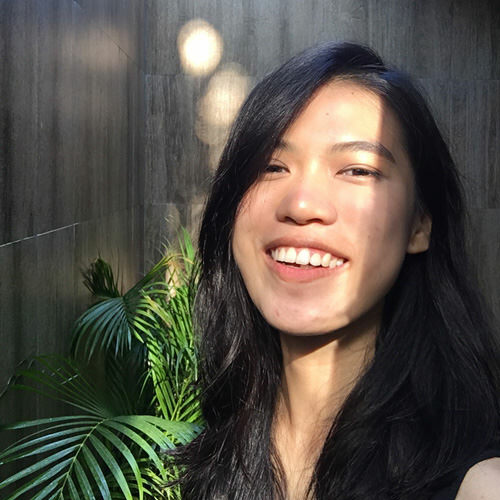 Any other tips or story to share? Glad you mention Magelang. 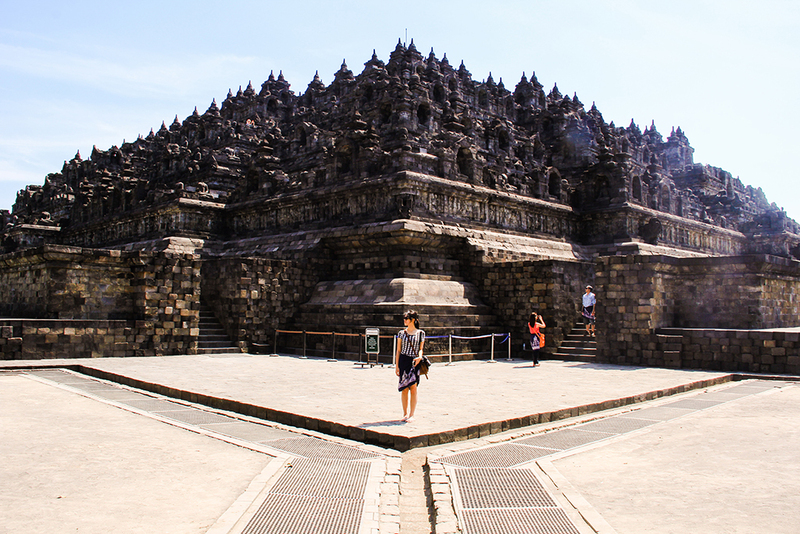 Most people think Borobudur is in Jogja. Harga tiketnya lebih murah dari pada ke Candi Prambanan, Fotonya keren dan sungguh apik. Resolusinya ok banget. gorgeous pictures! I'm in love! 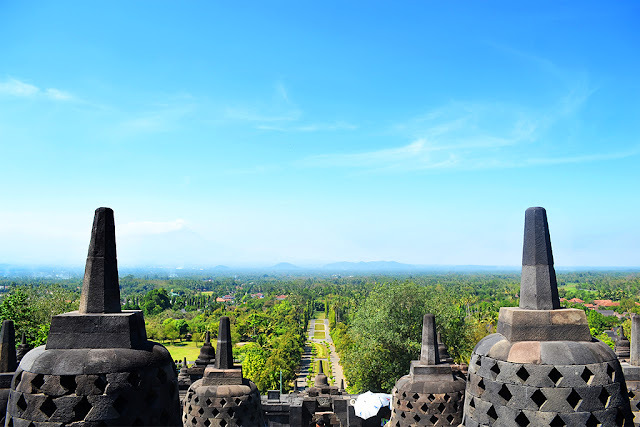 Seru lagi kalau bisa melihat sunrise dari Borobudur, benar-benar indah. hello vonny, welcome to my hometown, magelang! next trip, you should try to explore another side of this city. anyway, have you tried mangut beong? about 3 km from the temple. Iyaa nanti pasti explore lagi kalo ada kesempatan ke Magelang kedepannya :) belum pernah nyoba mas..
Wow! Your pics look amazing! What a great place to visit.